God is spirit, but as Krishna reveals in the Bhagavad-gita, matter is His energy. Because we cannot perceive spirit in our present condition, Krishna allows us to see Him in His Deity form made of material elements. He tells us that the Deity installed according to the directions of the scriptures is identical to Him. 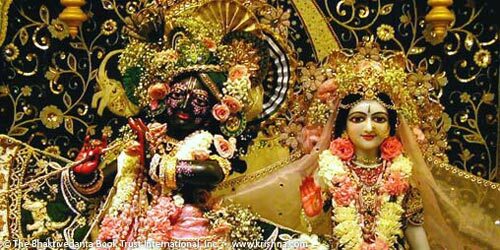 Deity worship is an important process to purify our vision so that we can eventually see Krishna's spiritual form. Therefore Deity worship must be performed with attention and devotion. It is a tangible way to serve God directly in our present state. Deity worship is not idol worship, but is worship of the Lord according to His instructions. Idolatry is the worship of an imagined form of God.